It's down to the players, not the coaches. There are world-class players not delivering. We're going to fight to the bitter end. A change of format might be able to help us express ourselves. If we want to keep hold of the Ashes we have to put in a big performance in Chelmsford. "England will only hope they learn lessons and take them into the T20s." England's Georgia Elwiss, speaking on Sky Sports, on the prospect of winning the three T20s: "We have to be confident. We have to go into that series with a really good attitude. It's going to be like tournament cricket." It's really disappointing. I thought at tea time we had a sniff of holding on. We simply weren't good enough over the four days. We're not delivering as a batting unit, there's poor shot selection – it's not through lack of trying. It's been a common theme in the last three internationals. I guess we’re not getting a platform and then choosing poor options. We’re not learning quick enough. "England's senior batsmen have got to stand up because their bowlers performed well." England's Georgia Elwiss, who made 46 on the final day, on Sky Sports: "Me and Lydia (Greenway) built a really good partnership but it wasn't to be today." On Ellyse Perry, who took 6-32: "She's a world-class bowler and she deserved her wickets." Ellyse Perry has been talking about taking the wicket of Lydia Greenway, who was bowled when she ducked under a low one. It was a bit of a strange one and indicative of how the pitch was low and slow. It was a strange wicket. Our confidence was pretty high, we knew at some point they would crack. They made it difficult for us. We probably shut the game down early with the win being out of their reach. Other than Georgia Elwiss (46), no other England batter passed 16. In the first innings, six players got in and reached double figures but none could reach 40. Australia captain Meg Lanning on TMS: "Greenway and Elwiss batted really well. There's always one partnership that's really hard to break." On Jess Jonassen, who made 99 and 54: "She was batting on a different deck to the rest of us, so she was certainly a big difference in this game. She's one to watch." "They have got a week to recover but it's going to be a tough task to bring them back up." Australia captain Meg Lanning on the three T20s that remain in the series: "England are a class side and they've got players there who can win games. We'll have to play well to win the T20s." We've still got a bit of cricket to play. We're in a handy position and that's pleasing but we still have to win a game which will be tough. We'll certainly celebrate but we want to win one more game. Australia captain Meg Lanning on Test Match Special: "This Test match was massive for us. We knew it would put us in the box seat. "Winning the Ashes is the one thing that we haven't been able to do in the last five years. We came here really confident." Australia's Ellyse Perry, speaking to Sky Sports: "It was nice to come out after tea and bowl like we did and finish like we did. "I thought Meg bowled really well before tea, it was nice to come out and finish it off quickly. I think we bowled well across the team today. There wasn't too much movement today, I don't usually bowl like that but it was indicative of how the game went. "We go to Ireland next and play three T20s against them which will be a great warm up for the rest of the series. Winning this Test match marks us down as having a great advantage. We'll enjoy it tonight but we'll look forward to T20s now." To put things into perspective, Australia scored their runs at 2.79 per over in their second dig (2.71 in first). England scored at 1.70 and 1.98 in the first innings. Elysse Perry ended with figures of 6-32 after picking up 3-38 in the first innings. Australia have been better in every department. They batted better, fielded better and some of their bowling has been nothing short of sensational. "It's such a resounding victory, but it still flattters England because the rain helped them so much." "It's nice to be here to call an Australia victory in an Ashes series. This is a wonderful achievement by this team." Well done to Australia. They have taken an 8-2 lead in the multi-format Ashes series and need to win or draw just one of three Twenty20 internationals to regain the urn. England have been blown away. The umpire's finger goes up for a final time, signalling the end of England's innings, Test, and possibly the series. Kate Cross gets off the mark with a neat two through the on side. Same ball next up, same outcome. Ton up. "Australia kept the field up; they had plenty of fielders around the bat. She has done absolutely brilliantly but, for now, Elwiss has left the building." "England are crumbling now. Their resistance is fading fast." Elwiss has left the building... and so have England's slim hopes of saving this game. A simple catch, from a full toss, is chipped to mid-on. Nine down, one to go. Anya Shrubsole, who scored a 47-ball duck in the first innings, is off the mark straight away here with a single. Sarah Coyte races through an over, five dots and a four for Georgia Elwiss. "I've never seen that - a player bowled ducking under a bouncer. I'm still in shock." "Brunt wasn't going to die wondering. Did it come off the helmet? I don't know. It looked like she may have swung and missed. She had the palms up and was shrugging as she walked off." Make that 15 wickets on tour, and five in the match! Perry bounces out Katherine Brunt but her opposite fast bowler tries the hook shot but feathers behind. Debatable whether she made any contact with the ball, but the finger went up and Australia are now two wickets from victory. Ellyse Perry likes it in England - she's Australia's highest wicket-taker (14 at 17.85) and run-scorer (499 at 71.28) on this current tour. Decent stats! She's chasing a five-fer here and is not impressed when hit for four off Katherine Brunt. "We could be in for a fun passage of play while Brunt is at the crease." Katherine Brunt drives the ball through mid-on and tries to pull Georgia Elwiss through for three. The non-striker wisely turns her down. Just the two. Brunt is probably the only person in the ground who thinks England can still win. Great attitude to the game. Never say die. "The wickets of Greenway and Marsh in successive balls has really opened up the door for Australia." "England are mentally shot. The players who normally have the energy and the talent don't seem switched on. Australia have come out with that mental toughness." Ellyse Perry has her tail up now - running in hard and beating the outside edge time and again. She then bowls a lovely yorker which Georgia Elwiss does well to keep out. Twice the debutant is squared up though. Ominous. You've got to feel for Georgia Elwiss on debut - she hit a punchy 17 in the first innings and is the last woman standing in the second, marooned on 41 not out as wickets tumble at the other end. Hat-trick ball... Ellyse Perry charges in, but fires it down leg and Katherine Brunt survives. "Marsh was nowhere near that. She did not get behind it and her off stump has been flattened." "It's reaching that embarrassing stage now. That's intimidation; that's fear. It looked like fear in the eyes. With the manner of dismissals - Taylor, Edwards, Greenway and now this - England are going to be crying when they come off the pitch today." Two in two. Ellyse Perry is on a hat-trick as she bowls Laura Marsh neck and crop. Top of off stump is splattered, with Marsh backing away and playing down middle. Awful. "The set-up of the bouncer last over, which hit her in the chest, flustered her. She just made the decision to cover herself. She should have got back into line." "Bowled - behind her back. That is a pretty ugly dismissal. That is a big, big wicket." Lydia Greenway has a Chris Read moment and England are back in the mire. Ellyse Perry digs in a bouncer and Lydia Greenway ducks under it... but is bowled. Leg stump. One never to watch again for poor Lydia. If England were to go for victory here - very unlikely - they would need to score at 4.95 an over. I'm surprised that Australia don't have more close fielders in. There's just three close catchers at the moment. I'd have everyone round the bat. Introduce a bit of claustrophobia for the batters. While England rack up the dot balls, let me get something off my chest. It's Mrs Higginson's birthday tomorrow and I found a lovely card for her. Went to pay for it... £6. Is it only me who is shocked by the price of cards these days? No, I didn't buy it. Back to far more important matters for everyone else, Lydia Greenway is rapped on the gloves by an Ellyse Perry lifter. Brute of a delivery. Just a single from the over, worked off the hips by Greenway. That is the 50 partnership off 184 balls. "Elwiss has given England a glimmer of hope, but 40 overs is a long way to bat from here." Sarah Coyte, with figures of 1-4 off her seven over earlier in the day, is on the money straight away. Nipping it this way and that, she induces an edge from Georgia Elwiss who slices four through the slips. "This game rests very much on this partnership. Australia know that, so that's why they're sniffing this one out." Right then. Let's evoke the spirit of Brigadier Block himself: Paul Collingwood. Thanks Chris. There's a minimum of 40 overs left in the day. That's a lot of batting for England. I think we can safely say that the victory is off the table for Charlotte Edwards' team now. Right. After being 29-5 earlier today, England are now 76-5 and have to survive for one more session. Marc Higginson will guide you through a pivotal evening of cricket in this Ashes series. "You talk about a marathon effort. It's at least been a half-marathon from these two." Lanning can't tempt Greenway into a shot. That's 19 balls without a run. It was looking very unlikely that England would make it to tea and be in a position to draw this match - well tea has been taken and somehow the hosts are still in this. "Lydia Greenway: 100 dot balls off 107 deliveries faced. Just what England needed, to be fair." Lanning has a very slingy style, but it's being dealt with by the England pair. Greenway sees six of them out of the hand and is not troubled. "Elwiss is playing a very mature innings. With 44 overs to go, England have done half the job." A reminder that after today, there are six points still to play for in the series. If Australia win the test, they are six points clear. A draw would keep the Aussies two points in front. Greenway collects her first runs in 29 balls with a sharp change of bat angle to steer into mid-wicket. At the other end Elwiss is unmoved by one wide of off stump. The umpires are just showing a mild bit of interest in where Lanning is ending her run-ups. England have really settled into an impressive rhythm now. Elwiss takes no run from the over, but it won't bother her, as she's shown she can find the runs when she needs to. Meg Lanning puts herself in the attack, to end this period of double-ended spin. Elwiss creates a leg bye. Greenway swings a streaky drive which thick edges short of slip, gets hit on the thigh pad outside the line and once again edges just short of slip. Nervy stuff. Greenway has reached her century (of balls received). If Elwiss were a beautiful art deco facade, Greenway is providing the bricks and mortar right now. Beams sends down six balls, Greenway sends back six dead ends. Maiden over. Elwiss is looking relaxed. She drops one in short of the slip fielder with some beautifully soft hands for two. Jonassen sends one down with plenty of air and Elwiss crisply drives to the extra cover boundary. Stirring stuff from the English woman. Beams is shouting at the top of her lungs, wanting lbw on Greenway. It's high and outside off and clips the flap of the pad. Once again she's claiming, before turning one past the edge. Lovely bowling. Elwiss really has her eye in as she punches one off to mid-wicket from right in front of the stumps before turning another way to square leg. Only the latter garners a run. "It was a good move by Australia to give themselves so much time to bowl England out. They have given themselves the best possible chance." A hairy moment for Greenway as she's right in the middle of her wicket, not playing a shot, as Beams thuds one into the pad. It's a bouncy one though, and that probably saves her. Two more runs off that over as well. Flying along. "Georgia Elwiss is in her debut Test and is showing more grit than we've seen from others." Jess Jonassen's left-arm spin comes into the attack. Elwiss steps back and cuts to third man. There's a brief moment where it looks like it might be close to slip, but it's fine. Elwiss is after Jonassen - a really nice drive to the deep cover boundary. It's raining runs in Canterbury. Beams is generating a bit of turn, but say it quietly, this England pair are looking reasonably comfortable. So much so, Elwiss even scores a run, England's first in 23 balls. This could well be a frustrating period for Australia, as this time Ferling finds Greenway unmovable. Add another scratch in the maiden over column. "Even if England do somehow win the Ashes, we still need to talk about these things. The performances in the ODIs and Tests need to be scrutinised. There's a danger that winning covers things up. They have been outplayed." While all those are losing their heads, etc etc, Georgia Elwiss is keeping hers. She goes into a more patient mode as she puts a wall up to six Beams deliveries. "I don't want to come across as negative, but with this increased media attention and professionalism and the money and cars which come with it, there is a scrutiny." Elwiss moves on to 20, steering Ferling around the corner for a single. Greenway meanwhile, it's not been pretty from the left-hander, but it's gritty. She drives one to backward point, but no run and then clips n to her pads. "There are certain players who have their spot without question, perhaps too readily. There's a sense that they are sticking with the old guard - players like Laura Marsh and Jenny Gunn - who haven't performed for a long time. They are reluctant to bring in fresh blood." Elwiss has what must seem half the population of Australia in her face, fielders crowding the batter. She has a slip and takes one on the pad from Beams, whose lbw call is dismissed. "I'm reluctant to say this, but there's some hubris about the England team. They feel they are on a pedestal above the rest but in reality it's a different story." Elwiss is flashing the willow. She's an absolute maverick. One wide of off stump looks nice but is cut off by the fielder. Ferling decides to add a bit of spice and goes short and high. Elwiss is happy to watch it fly over her shoulder and follows up with a single. Not strictly cricket... but there'll be plenty of mums and dads who know who this character is. Yorkshire's second favorite son, after Joseph Root of course. Greenway is very much the anchor to Elwiss's innings, but she has a boundary as she pulls Beams to the rope - it needed a mis-field mind. Normal service is resumed as Greenwood puts down the straightest of bats. Can they keep this going until early evening? Australia's hopes of some play against Northants don't look good. Holly Ferling, a right-arm seamer, is on for Australia. It's a definite loosener to begin with that strays way down the leg side. Tidy keeping from Healy to prevent the extras. But there's nothing she can do about Elwiss clipping her to the boundary. England were 29-5 at one point - this can probably be considered a mini revival. "In the three ODIs and the two innings in this Test match, England have only managed to bowl out Australia once. You're not going to win matches if you can't take 10/20 wickets." Elwiss opens up her stance and crashes one to long off. It's just a single but is a show of intent. Completely contrasting approaches from the England batters. 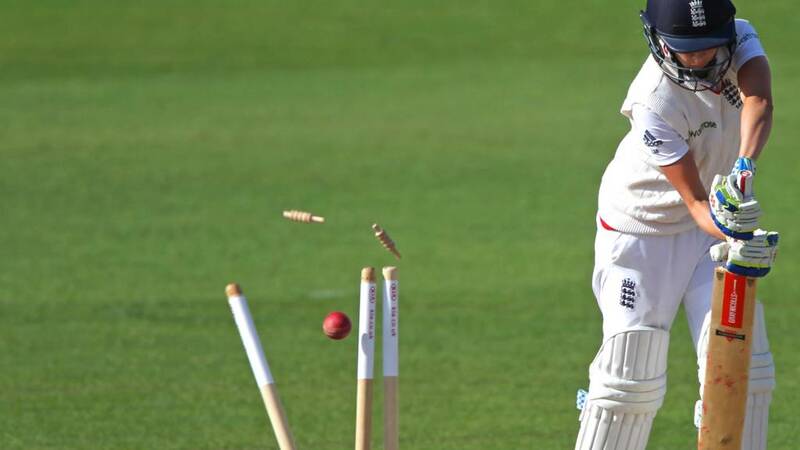 "Whilst on holiday recently I took my then five-year-old son to his first cricket match at Colwyn Bay to see Glamorgan v Lancashire. This was some serious father and son bonding. We played our own cricket (with mini set acquired that week from Thomas' cousin) on the outfield in the intervals and indeed after the match, chatted happily to other spectators, got Thomas' ticket signed by record-breakers Prince and Petersen and both leapt out of our seats in sheer amazement when the latter took a stunning, one-handed catch right under our nose. We picnicked, zoomed in with binoculars and generally had a great time, all the while Thomas' fertile mind was continually asking questions in a thirst for the game. We just and so had time to devour fish and chips before heading back to our digs. A truly memorable day for both of us. Needless to say he's now hooked." Greenway's eight might have been dragged out over 62 balls. But she still has some way to go eclipse her 22 from 117 in the first innings. Elwiss, meanwhile, has taken her 13 from 18. We're being treated to a bit of leg spin now as Kristen Beams comes into the attack. Her first ball has plenty of air and a decent length. But Elwiss can take a single through mid-wicket from a wide one. Aside from that, solid start from Beams. "There's no-one other than Charlotte Edwards who's going to make runs for England. There's a feeling that once she goes, they're so fragile." Jonassen has not only been stingy, but she's getting through her overs at a decent pace which is giving Australia more balls to torture England with. Elwiss collects a single off Schutt. Greenway is briefly worried by an inside edge that is safe. "England haven't learnt from the first innings. They should have watched how Jess Jonassen batted. But why are they not adapting to the situation?" Jonassen will be furious. Her last ball of the over is dinked into mid-wicket by Greenway for two. They're the first runs she's conceded in five overs. "England are now fully professional and you have to ask where the accountability is. Where does the buck stop? Is it the captain? Is it the coaching staff? Since the first match of the series, they have been woeful." Elwiss is getting a little bit excited, clipping one to fine leg for two. And then an absolute ripper from Schutt that swings a hair's breadth past the edge of Elwiss's bat and off stump. Elwiss is marching along though, relative o her team-mates, and takes a further three runs. "This is desperate by England - playing at balls they don't have to, playing across the line..."
If you don't have plans this afternoon, you can probably start making some. England have to hold on for the rest of the day with five wickets in the bank. Jonassen, Australia's batting hero, flies through her fourth over without conceding a run. A side note: England's lowest Test score is 35. Mike Chalmers: Umpiring in this game has been appalling #whereshawkeye. "England have been completely outplayed. It's turning into a horrible batting performance." Sciver could well have just caught the ground rather than the ball. That's possibly what the umpires are discussing but they can't overrule this anyway, so Sciver has to go. Georgia Elwiss collects a boundary from the second delivery she faces. "It looked like she played over it - that was a really unlucky decision." Hmm. Sciver has been given out caught behind. Or has she? The umpires are having a chat and Sciver has stopped in the outfield, looking very bemused. Normal service is resumed as Greenway defends her way to a maiden over from Jonassen. England need to scrap. "England are plummeting towards defeat if they just keep poking away at good bowling." "That was gone, gone, gone. Brilliant ball from Schutt - it swung quite late. Winfield is walking off so slowly, she's is still on the pitch." "This is what happens when you get bogged down. England in a hole that's turning into a big mine. Megan Schutt has her woman and England are peering down the precipice of defeat. Schutt has found plenty of swing and a bit of inward movement off the seam and this one has a straighter line. It's on Winfield's pad and she's off. "This is a dangerous method from Greenway, if you're not hitting it. You're leaving yourself wide open for the lbw." Left-hander Greenway is happy to come across and anchor her pad outside off stump to deal with Jonassen. I'm going to copy and paste the words 'maiden over' to save myself time. "Batting out for the draw is England's best hope. This partnership is absolutely crucial - it's between this and Nat Sciver to save the game." A change in bowler at the other end too, with Megan Schutt finding a bit of movement off the seam back into Winfield. The England batter does well though, administering a few forward defensives. Another maiden over - I think we might be saying that a few times this afternoon. Jess Jonassen showing she's not just handy with the bat as she comes on for some left-arm spin. It's a tidy maiden, but Greenway looks comfortable. Well, as comfortable as she's been since stepping to the crease. ‏@theskiver: No excuses. England's women badly let down by their senior batters in exactly the same way as Australia's men. It looks uncomfortable for Greenway, but she fends one to the on side from Perry as she sneaks on to six. Winfield makes short work of a short one, pulling to the boundary - that might settle everyone down a bit. Maybe? "A brilliant athletic bit of fielding from Perry. But it was right for England to have taken that single - they need to keep things moving." A scrappy single for Greenway has Winfield scampering at the other end. A direct hit from fielder Perry would have run her out. It's the only run of the over. Survival stuff from England at the moment. "Greenway is not looking comfortable against Ellyse Perry." Lydia Greenway has hit the ball with her pad more than her bat. Ellyse Perry has got her worried and one inside-edges off bat to pad. She then mistimes a drive, comes very close to edging and then takes one on the thigh - the latter gets a single. No sign of the pressure relenting. Lauren Winfield fends off all six deliveries from Sarah Coyte, but no run from the over. @TedDitchburnNNP: Are our England women Australian men in disguise? "That's poor, that's down to a lack of concentration, she'll be disappointed. It's unlike Charlotte to reach for a wider delivery. It wasn't a particularly good ball. The two main batters for England are in the hut now." Oh Lottie, Lottie, Lottie. First ball of the session and captain Charlotte Edwards decides to wave at one which is well wide of off stump from Ellyse Perry. There's an edge and it's in the gloves. In the Women's Ashes down under, Sarah Taylor scored just one run over the two innings. She did get 70 against India last summer though (30 &40). I'm off for some lunch now, so Chris Osborne will take you through the afternoon session. Enjoy. How ironic that the men's game is scheduled for five days and ends in two and a bit, while the women's game, scheduled for just four days, could run out of time. Over in Galle, India are closing in on victory against hosts Sri Lanka. They need another 153 runs to win with nine wickets still in the bank. Dinesh Chandimal scored an unbeaten 162 off 169 balls for Sri Lanka but his side were bowled out for 367 in their second innings. Off-spinner R Ashwin, opening the bowling, took four wickets. The Australian men's team are scheduled to be in action against Northants today. But there's no play before lunch because of the weather. SMS Message: Spare a thought for Alex Blackwell? She had around 150 balls to score her 50. By far the worst strike rate. Spare a thought for Alex Blackwell? She had around 150 balls to score her 50. By far the worst strike rate. Test Match Special will be speaking to author David Tossell, in around 10 minutes' time. You can listen to that via the icon on this live text commentary. So, do England retreat into match-saving mode? Or can they still win this? If they try and block their way out of a hole, I worry they'll end up falling into it. Sarah Taylor's pair of ducks is the 26th in women's Tests and the ninth by an England player. England get through to lunch without further loss of wickets. Australia's morning couldn't have gone much better. England are on the rack here, Ellyse Perry shaping the ball back into Charlotte Edwards' pads and she goes up for a strong appeal. Not out. Close though. "That's the moment. It's disappointing. The ball has pitched outside off stump and Taylor's foot was planted down the pitch with the bat dangling outside off. Taylor truly is Perry's bunny. She's had a pair of ducks and that's not good." A horrible, horrible dismissal... Sarah Taylor's trigger movement sees her go back and across, exposing her off stick which is pegged back by Ellyse Perry. She was playing down Bakerloo to a ball heading down the Central Line. A pair in the match for England's golden girl. Sarah Coye is bowling at 60mph - a good 10mph slower than the likes of Katherine Brunt, but her nagging line and length is proving just as effective. After getting rid of Heather Knight with an inducker, she almost sees off Sarah Taylor with one which shapes the other way. Play and a miss. "That's a big blow for England. That's the first of 10 Australia are looking for. It was pitched far outside off, it came back, I think it was a good call. "This is a big, big moment in the match. I've got shivers down my spine. Sarah Taylor is in at a crucial juncture and I think this wicket will decide what will happen today." Oh dear... not what England needed. Sarah Coyte nips one back into Heather Knight, the front pad is planted and the finger goes up. Email Message: Don't mean to be disrespectful to a fine county player, but Graeme Hick's eventual and much anticipated arrival on the Test scene as an England player. Anticlimax. Don't mean to be disrespectful to a fine county player, but Graeme Hick's eventual and much anticipated arrival on the Test scene as an England player. Anticlimax. For the record, Graeme Hick's Tests average was 31.32., compared to a first-class average of 52.2. Lauren Winfield is in pretty good touch this summer - scoring 99* for Yorkshire Women three weeks ago. The ball is finding the middle of the bat, but also the close fielders. She finally breaks the shackles by whipping four through the leg side. That'll do. Sarah Coyte, tattooed sleeve showing, tests Heather Knight with some nagging line and length. A play and a miss gets the wicketkeeper interested. Which ones to play, which ones to leave: a dilemma all opening batters wrestle with at one point or another. We're not sure if Shane Warne is watching the women's Ashes, but whatever he's watching, he has a very comfortable seat. Ellyse Perry is not threatening, sending down another set of six which aren't scored off but fail to trouble Lauren Winfield. New Zealand international Frances Mackay is enjoying the action at Canterbury. Sarah Coyte is brought into the bowling attack as Australia shuffle their pack before lunch. The 24-year-old, who has a twin brother called Adam, bowls flighty medium pace - trying to angle the ball in. When she strays, singles are taken into the leg side. Which cricketing moment fell flat? Give us your best ones. Use #bbccricket on Twitter, email us on tms@bbc.co.uk or text us on 81111, but make sure you include your name and location. Email Message: When Gary Kirsten was bowled by Mark Butcher during the 1999-2000 Test in Durban. He was level with Darryl Cullinan when Butcher bowled him, bringing an end to the second longest innings at the time. What a let down! When Gary Kirsten was bowled by Mark Butcher during the 1999-2000 Test in Durban. He was level with Darryl Cullinan when Butcher bowled him, bringing an end to the second longest innings at the time. What a let down!